Our latex-coated polyester duck will shed water but is not waterproof. 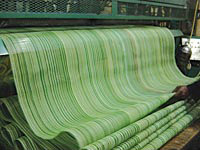 This fabric is often used for very tough applications such as asphalt tarps and painers for horse outfitters. Available in various widths. Black and Honey Brown. Weights range from 11 oz. to 32 oz. per sq. yd.